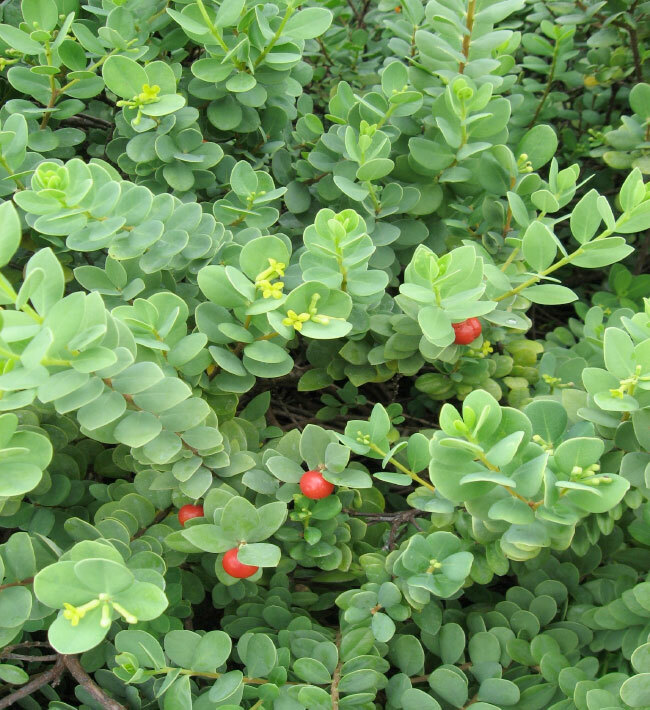 Wikstroemia uva-ursa, known as Akia in Hawaiian, is only found in Hawaii, which makes it endemic. Used by Hawaiians as a fish poison so the men throwing nets could catch more fish. Common now throughout Hawaii, originally rare, found in coastal areas of Kauai, Oahu, Molokai, and Maui. Easy to cultivate, which has contributed to it becoming more common in landscapes. Crushed leaves and stems were used as a poison to stupefy fish which were then gathered by the early Hawaiians. The fish were safe to eat because ʻākia is not known to be poisonous to warm-blooded creatures by means of this fishing method. However, certain varieties of ʻākia were used in old Hawaii as a death penalty for those who broke kapu. The guilty party was forced to drink the juice of ʻākia, causing seizure and death.